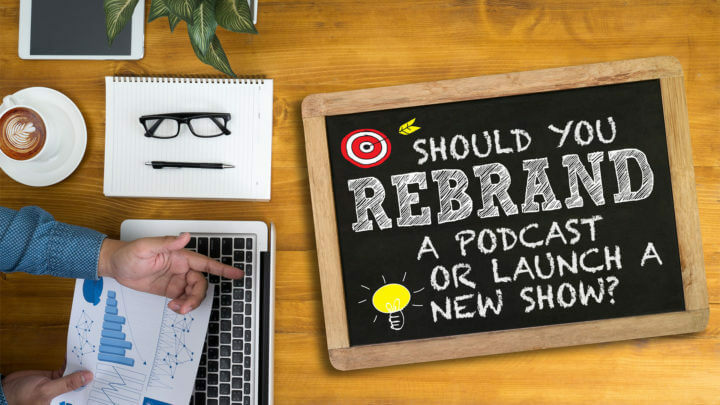 Should You Rebrand a Podcast, or Launch a New Show? When changing directions in podcasting, should you rebrand your existing podcast and keep your audience, or launch a new podcast and start over from nothing? This is a common question I've received and an issue I've seen other podcasters face. Just recently, Kala Williams, host of Marketing for Yoga & Wellness Professionals Podcast ask me this question on Twitter. Here are my recommendations. It's totally acceptable if you're pursuing one thing and then realize something else is better. What I do think is an unwise choice is not putting your best effort into your choice, or holding to a commitment to press through the hard times. For this discussion, let's consider that you know changing direction is the right thing for you to do. “Rebrand,” “relaunch,” and many other business and marketing terms can lose their meanings to us. Critically evaluate what it is you want to change, as this should guide your decision in rebranding versus launching a new show. Here are some example questions you could ask yourself. Am I changing what I talk about? Am I changing how I describe my show? Am I changing my perspective on the same topic? Am I changing the audio or visual identity of my show? Am I changing which people I want to reach? When you want to change something about your podcast but it doesn't change the core message, you should consider a rebrand. Look at soda/pop/soft drinks (or whatever you call it in your region). Pepsi recently did a rebrand, but they didn't change their soda. Sometimes, they may slightly tweak their recipe, but it's essentially the same soda, intended for the same consumer, simply repackaged for whatever marketing reasons they have. Usually, it seems they rebrand to modernize themselves or to reach a new audience. Why did your audience choose your show? Think about what attracted your audience to your podcast. That's usually connected to the expectations you set with the promises you made. For example, The Audacity to Podcast has always been a podcast about podcasting. Yes, in the beginning I talked about Audacity a lot, and the name of my podcast was intentional for some double meaning. Since I launched the show in 2010, every episode has been focused on some aspect of podcasting: tools, resources, how-tos, philosophies, encouragement, and more (not only limited to the “tech” of podcasting). My visual branding and marketing have changed over the years and will change again in the future. But the core message is the same and it's intended for the same audience. When you rebrand, you might change the visual design, the audio branding, the cohosts, the domain, or even the title. But the core of your podcast remains the same. If you're going to make a big rebrand, such as radically redesigning, changing your audio branding, or changing your show's name, let your audience know ahead of time. This will help prevent confusion and could enthuse your audience about the upcoming change. If your rebrand involves changing domains, social accounts, or other online “addresses,” try to redirect the old location to the new. This will help people transition as well as ensure no one gets left behind. Place a permanent, 301 redirect on your old website address. Place a permanent, 301 redirect on your old RSS feed, if the website redirect (or other tool) doesn't cover that. Recreate your old social account to point people to your new account. Monitor old email addresses and social accounts for people who haven't switched to your new brand. When you want to radically change the content you show with your podcast, then you should consider launching a new show. Let's reuse the soda example. If Pepsi wants to add vanilla to their core product (a brilliant idea! ), they're creating a different product that will appeal to different people. Thus, Pepsi Vanilla was born (long live vanilla-flavored sodas!). It's a new flavor that deserves to exist next to their existing offerings. Relate this with your show. If what you want to talk about is different from what you have already been discussing or is different from the promises you made to your audience, you should probably launch a new show that will appeal to different people. For example, if I wanted to start talking more about Apple products in The Audacity to Podcast, and such discussions are not about podcasting. Then I'm already lying to you about what you can expect from my podcast. Instead, I might discover I have a passion for Apple products and launch a completely separate show for that topic and to appeal to a different audience. Launching a new show means creating a new RSS feed, new podcast cover art, submitting a new show in iTunes, new ranking and reviews, and maybe even a new website (if the new show is not relevant to the existing audience). If you decide to stop talking about your other content, I recommend you keep that old show separate and online. This means people will continue to find you through that old content, and will continue to benefit from the value you already put out. I think it's quite unethical if you change your existing show but keep the same RSS feed. Sure, this means your “new show” will carryover all of those subscribers. But you're stealing from yourself by forcing people to get content they may not want. A decision like this seems motivated by greed and laziness, not generosity. Yes, starting a new show means starting with no audience. But think of the benefits! You can leverage your exist audience to make the launch of the new show even better. Because of your more advanced experience, the new show could greatly benefit from being featured as a new show (including in iTunes “New and Noteworthy”). With a new show dedicated to your new message, that show can focus on being optimized for that specific content. People can binge-consume your entire archive and receive entirely relevant content. Your website, branding, episodes, reviews, and more will all be focused on the content of the new show. Thus, there will be no confusion, no deception, and no dashed hopes. There may be those times where you drift from your promised content, or maybe you weren't clear on your content in the first place. For example, I could start the Daniel J. Lewis show to talk about whatever I feel like. At some point, I may realize that I have a lot to say about the same couple topics. Thus, I may rebrand the Daniel J. Lewis show to better communicate what I primarily talk about in that show, and then I launch a new show to address the other recurring topic in a more focused way. Then, the two shows can crosspromote each other. This doesn't have to mean twice the work, either. It could be an equal split to run the two shows, but now each show is “niched down” and thus more valuable. Listen to our previous Podcasters' Roundtable rounds: Podfading and What Could Podcasting Be Doing Better?